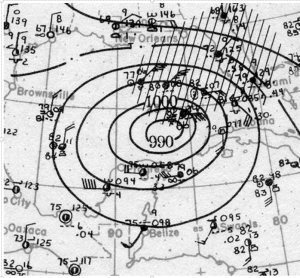 Surface weather analysis of the sixth hurricane of the 1921 Atlantic hurricane season on October 24, 1921. 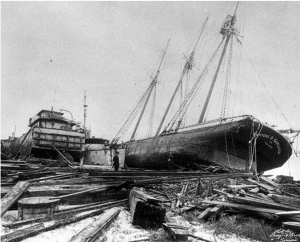 One of the most significant hurricanes to hit Tampa occurred in October of 1921. The first recorded major hurricane to hit Tampa occurred in September of 1848. The Chief Hydrographer at the Panama Canal may have reported the first indication of a developing disturbance over the Caribbean Sea between October 13th and 18thwhen the barometer fell steadily and winds prevailed out of the north with frequent heavy rains, particularly on the Pacific side of the Canal Zone. Suddenly, on Oct. 18th, the winds reversed and blew steadily from the south ending the rain. The wind also picked up after the 18th, averaging nearly 20 mph between the 20th and the 22nd with a peak 5-minute wind speed of 35 mph. The developing disturbance moved north-northwest from the Southwestern Caribbean Sea passing near Swan Island on the 22nd where the barometer dropped to 29.20 inches (989mb) between 10 am and Noon. The wind, which had been blowing out of the north across the island, shifted to the south-southwest and reached a peak velocity of 80 mph (70 knots). A hurricane had indeed been born! By October 23rd the hurricane moved through the Yucatan Channel where the schooner Virginiareported a minimum pressure of 27.80 (941mb) as it entered the eye of what was now a category 4 hurricane. The next day the SS El Estero at latitude 25-36N longitude 84-24W encountered the eye of the hurricane at about 10 pm as the barometer reached a minimum of 27.84 inches (943mb). At noon that same day, a Hurricane Warning was issued for the West Coast of Florida from Key West to Apalachicola. During the night of the 24th and the morning of the 25th the hurricane turned toward the north-northeast then later northeast finally making landfall near Tarpon Springs, Florida where a minimum barometer reading of 28.12 inches (952mb) was recorded at about 2:15 PM that same afternoon. This reading suggests that a max wind at landfall of about 110 knots (125mph) which would make this storm a Cat 3 hurricane. After landfall, the storm tracked east-northeast across Florida exiting near Daytona Beach early on the 26th as a Cat.1 hurricane. The US Weather Bureau office in Tampa reported a storm surge of 10.5 feet above mean low water at about 2 PM EST on the 25th and a rainfall total of over 8.5 inches, along with a minimum barometer reading of 28.81 inches (976 mb). The radius of hurricane force winds was fortunately small and the peak wind reported at Tampa was 59 knots (68mph) with a peak gust of 75 mph recorded atop a tall building in downtown Tampa. The adjusted surface peak wind was later estimated to have been 49 knots (56 mph). Most of the damage done by this storm in Tampa and St. Petersburg was due to the storm surge. The 10.5 foot storm surge in Tampa Bay was the highest since the Great Gale of 1848. The tide swept over the seawall along Bayshore Drive in Tampa flooding some of the most expensive houses in the city. There was considerable flooding in downtown Tampa where 3 people were reported as drowned. At St. Petersburg the tide was reported at 8 feet 5 inches above normal and all four city piers were badly damaged or destroyed. At Egmont Key and at Sanibel island to the south, the tide was reported to have nearly covered both islands with water. Flooding was also severe at Palmetto Beach, Edgewater Park and Desoto Park where some houses had the water rise up to the second story windows. At Palmetto Beach 50 houses were reported destroyed by the tide and by drifting cedar logs that were chained together and had been enroute to the Tampa box company to be made into cigar boxes. 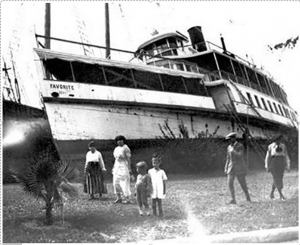 Many vessels were wrecked or washed ashore including the “Geneveve”, the “Hypnotist”, the “Pokonoket” and the steamer “Favorite”. Overall damage was estimated to be at about $3 million (1921 dollars). 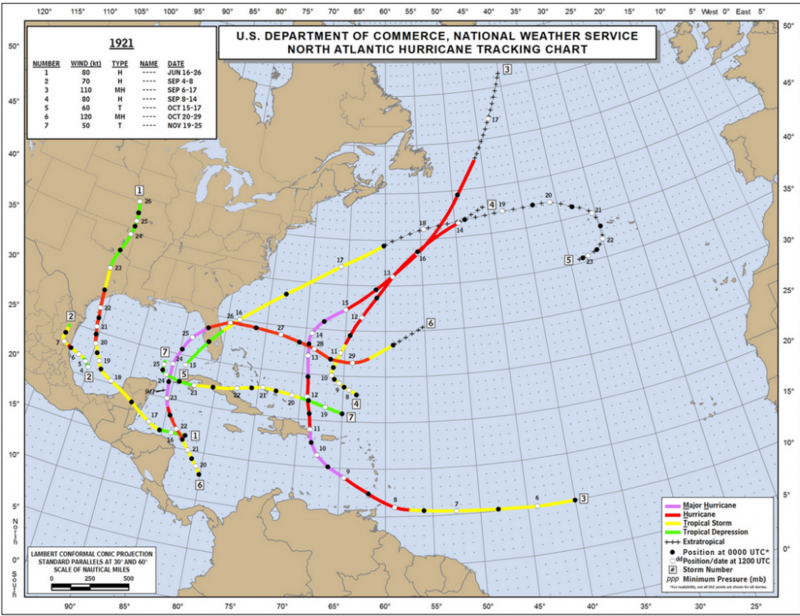 The total number of hurricane related deaths is unknown but at least 8 deaths were directly related to the storm. Bowie, E. H., 1921: The hurricane of October 25, 1921, at Tampa, Fl. Mon. Weather Review v., 49, 567-570. This entry was posted in Tropical Cyclones, Weather History and tagged 1921 Hurricane, Hurricane, Storm, Tropical Cyclone. Bookmark the permalink.